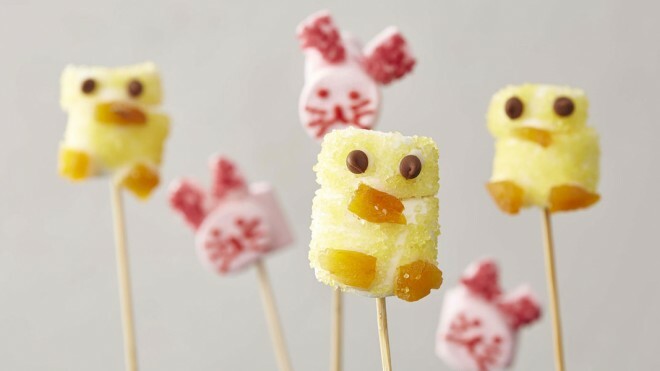 Creating these fun little marshmallow characters is a great way to spend the afternoon with the kids – the key is the white icing used as ‘glue’! To make a chick, take two white marshmallows and cut one in half. Stick a half marshmallow onto the top of a full marshmallow using a little white icing to help them stick together. Tip the yellow glimmer sugar into a small bowl. Place the tablespoon of caster sugar into a small bowl and stir to dissolve. Dip the two marshmallows into the sugar water and roll in the glimmer sugar to coat. Cut 3 small pieces of dried apricot to make a beak and 2 feet for your chick. Use small blobs of icing to stick these on. Put 2 small blobs of icing for eyes and stick on the chocolate balls. To make a bunny, take two pink marshmallows and cut one in half. Stick a half marshmallow onto the top of a full marshmallow using a little white icing to help them stick together. Cut the remaining half a marshmallow in half again. Cut one of those halves in two to create ears, use the remaining piece for the tail. Dip the sticky cut side of the ears and tail in the strawberry crush sugar decorations. Stick onto the bunny body using a little white icing. Use the red icing pen to create eyes, a nose and whiskers.